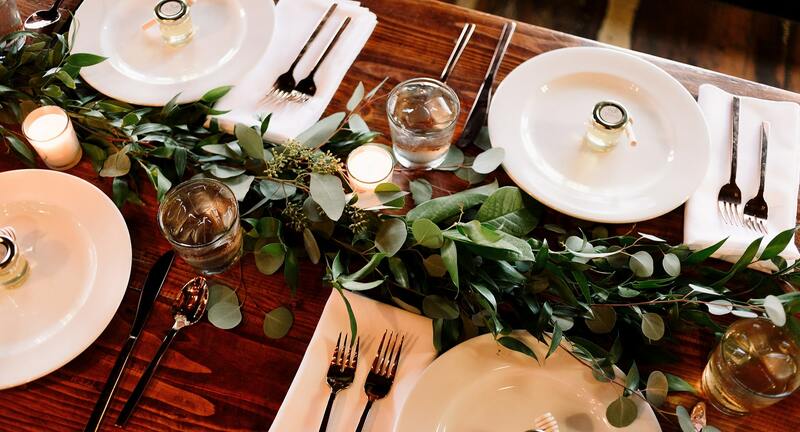 From tips on how to keep guests out of the kitchen to the only table linen color you need to own, we have the answers you need to bring your A-game, even when you're running low on time before guests arrive. It’s a proven fact: people gravitate towards the drinks. So, set up your bar outside and pair it perfectly with an outdoor fire pit to keep guests warm. This tip actually serves a dual purpose: it gets your guests outside to enjoy the fresh air and beautiful fall weather, while simultaneously keeping the majority of them out of your kitchen to reduce potential crowding. Bonus points if being outside also prompts a game of football to start on the lawn. If you’re going to take our first tip and have guests hang out outdoors before dinner, we also recommend having an easy-to-serve (and easy-to-eat) appetizer, such as a stew, as a starter. Serve it in a coffee mug to really emphasize the fall coziness. And why not try out one of these comfort food soups from Delish. Do you have a collection of single, mismatched candlesticks floating around? Consider bringing them together, consolidating and grouping them, where they can serve as either a focal point in the house or on the dinner table. Play around with a couple different variations. One of our favorites is to line them up to resemble a runner down the center of your table. On the topic of candles, make sure they aren’t too tall. You don’t want to block anyone’s line of sight. Nothing is more uninviting than table decor that obstructs conversation. Designer Frank Bostelmann recommends cutting your candles in half, burning them down, or buying shorter ones. “That way, guests across from each other aren't trying to look through a forest of candlesticks,” he says. With all those mixed-and-matched candlesticks and cut-down candles, you should have quite an ensemble to choose from. Use this to your advantage to create some visual intrigue by placing candles of varying heights next to each other. Votives are an easy way to balance and contrast your tall candlesticks (this still applies when they’re chopped in half). As promised, the only table linen color you need to own: white. A white tablecloth serves as the perfect canvas for putting together both your decor and your Thanksgiving feast. Never fret about which tablecloth to use and what color might clash with what accents. White provides a beautiful starting point, a clean canvas that allows you to use whatever colors you want for decor since it won’t clash, but will rather enhance just about any spread. Last, but certainly not least, bring in the final sense: scent. Smell plays an important part of the season. And research has shown that smells trigger more vivid emotional memories and are better at inducing that feeling of “being brought back in time” than images, but since it’s invisible, it’s all too easy to skip right on past in favor of visual decorations. So make sure to take a few minutes to emphasize this. And nothing gets that cozy, Thanksgiving, holiday scent brewing quicker than a bowl of clove-pierced oranges. Looking for other ideas? Check out House Beautiful’s roundup on how to make your home smell just like a bakery. And there you have it, several easy tips to get your home in tip-top holiday party shape, even at the last minute. Do you have any holiday home prep tips you would like to share? Comment below!